All Web addresses mentioned were functional as of 11-28-16. From the Cumberland Gap to the Atlantic Ocean, this is Virginia Water Radio for the week of November 28, 2016. That music is part of “Drive the Cold Winter Away,” by Timothy Seaman of Williamsburg, Va., accompanied by Phillip Skeens. It opens our annual episode on winter preparedness. In 2016, winter comes to Virginia—astronomically—on December 21, whether you’re ready or not. Here are some tips from the Virginia Department of Emergency Management for staying safe from winter’s hazardous roads, power outages, and fire hazards. *Get road conditions from the Virginia 511 telephone system, Web site, or smartphone app. More information on preparing for severe winter weather and other emergencies is available online at vaemergency.gov. Thanks to Timothy Seaman for permission to use this week’s music, and until next spring comes along to “Drive the Cold Winter Away,” here’s hoping that you can stay warm, dry, and safe. “Drive the Cold Winter Away” is a traditional tune performed by Timothy Seaman and Phillip Skeens on the 1998 album “Celebration of Centuries,” copyright by Timothy Seaman and Pine Wind Music, used with permission. More information about Mr. Seaman’s music is available online http://timothyseaman.com/. This music was previously featured in Episode 300, 1-25-16, on winter words. Winter-weather preparedness poster from the Virginia Department of Emergency Management, online at http://www.vaemergency.gov/prepare-recover/threat/winter-weather/. 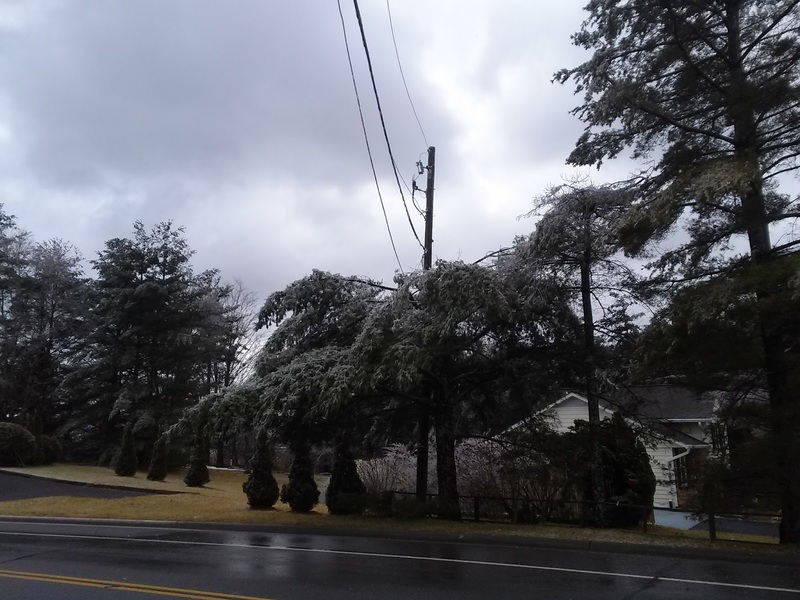 Icy tree limbs threatening to down power lines are a frequent winter concern in Virginia. Photo taken in Blacksburg, Va., January 25, 2015. *Where will you meet up with family members if you can’t return home? *Get an emergency plan worksheet at http://www.vaemergency.gov/prepare-recover/make-emergency-plan/. *Get road-condition information by calling 511 or checking www.511Virginia.org. Download the Ready Virginia app, online at http://www.vaemergency.gov/prepare-recover/ready-virginia-mobile-app/. *A checklist for gathering emergency supplies. The recommendations below are from the National Weather Service, “What To Do If You're Caught in a Winter Storm,” online at http://www.nws.noaa.gov/om/winter/during.shtml. *Don't leave the house without the following: a fully charged mobile phone charger and an emergency supplies kit in your car. *Eat and drink. Food provides the body with energy for producing its own heat. Drinks lots of water and other non-caffeinated, non-alcholohic drinks to prevent dehydration. Cold air is very dry. Deborah Byrd, “Everything you need to know: December solstice 2016,” EarthSky, online at http://earthsky.org/earth/everything-you-need-to-know-december-solstice. CNN, “Solstice Fast Facts,” 6/23/16, online at http://www.cnn.com/2013/06/03/world/solstice-fast-facts/. 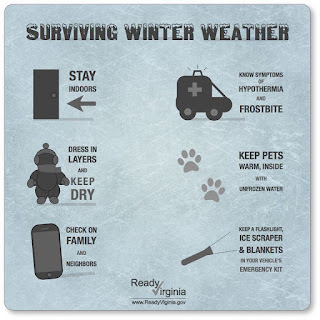 Virginia Department of Emergency Management (VDEM), “Winter Weather,” online at http://www.vaemergency.gov/readyvirginia/stayinformed/winter; and “Winter Preparedness Week 2015,” online at http://www.vaemergency.gov/readyvirginia/winter/winter-preparedness-week. The VDEM’’s “Ready Virginia” program, online at http://www.vaemergency.gov/, is the Commonwealth’s central source of information on preparedness for all types of emergencies and disasters. Virginia Department of Transportation, “Virginia Traffic Information,” http://www.511virginia.org/. National Weather Service, “Weather and Water Events Preparedness Calendar,” online at http://www.nws.noaa.gov/om/severeweather/severewxcal.shtml. This page lists events nationwide, by state. Virginia Water Central News Grouper posts on weather, available online at http://vawatercentralnewsgrouper.wordpress.com/category/weather/. 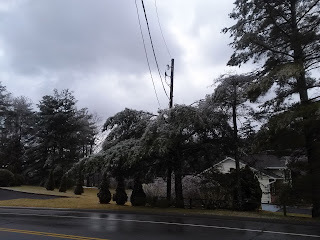 The posts—mostly about Virginia, but in some cases about other areas—cover primarily severe-weather events, precipitation and drought, and tropical storms during the June-November Atlantic tropical storm season. All Water Radio episodes are listed by category at the Index link above (http://www.virginiawaterradio.org/p/index.html). See specifically the “Weather/Natural Disasters” subject category. Episode 292, 11-30-15, “Winter is Coming” by The Steel Wheels Gives the Cue for Winter Preparedness and Safety in 2015-16. Episode 253, 2-16-15, “Cold World” by Kat Mills, for Winter Preparedness and Safety, repeating 242 (12-1-14). Episode 190, 12-2-13, Cold Winds Return and So Does Winter Weather Preparedness Week in Virginia. Episode 300, 1-25-16, Winter Word Whirlwind. Episode 249, 1/19/15, At the Freezing Point (on water’s properties at cold temperatures). Episode 199, 2/3/14, Snow and Ice Follow Physics and Chemistry. Episode 144 1/14/13, Ice on the Pond.